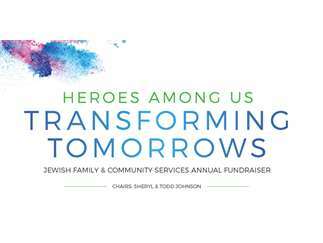 Please join Jewish Family & Community Services for our annual fundraising event, Heroes Among Us: Transforming Tomorrows, on Thursday, April 4, 2019 at the Prime Osborn Convention Center. Chairs Sheryl & Todd Johnson will join the community in highlighting the life-changing efforts that JFCS brings to the First Coast through its various programs. Cocktails at 6 p.m. | Dinner & Program at 6:45 p.m.Individual tickets cost $150. Sponsorship levels are also available. Purchase tickets at jfcsjax.org or by contacting Donna O’Steen at 904.394.5714 or dosteen@jfcsjax.org. JFCS embraces a philosophy of prevention and education to address the community’s most pressing problems. Funds raised from this annual event will improve the lives of thousands as JFCS works to serve neighbors of all ages, races and faiths. The agency’s six core programs work together to:	Protect at-risk children Keep families together	Prevent homelessnessFeed the hungr	Help struggling students succeed Strengthen the coping skills of individuals and families facing challenges DATE: Thursday, April 4, 2019TIME: 6 p.m.LOCATION: Prime Osborn Convention Center, 1000 Water St., Jacksonville FL 32204 COST: $150 per ticket | Purchase at jfcsjax.org EVENT SCHEDULE: Cocktails at 6 p.m. | Dinner & Program at 6:45 p.m.